This “Terrestrial Forest Management Plan for Palmyra Atoll” was developed by the U.S. Geological Survey (USGS) for The Nature Conservancy (TNC) Palmyra Program to refine and expand goals and objectives developed through the Conservation Action Plan process. It is one in a series of adaptive management plans designed to achieve TNC’s mission toward the protection and enhancement of native wildlife and habitat. The “Terrestrial Forest Management Plan for Palmyra Atoll” focuses on ecosystem integrity and specifically identifies and addresses issues related to assessing the status and distribution of resources, as well as the pressures acting upon them, most specifically nonnative and potentially invasive species. The plan, which presents strategies for increasing ecosystem integrity, provides a framework to implement and track the progress of conservation and restoration goals related to terrestrial resources on Palmyra Atoll. 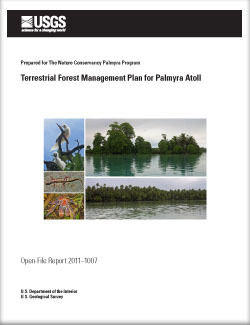 The report in its present form is intended to be an overview of what is known about historical and current forest resources; it is not an exhaustive review of all available literature relevant to forest management but an attempt to assemble as much information specific to Palmyra Atoll as possible. Palmyra Atoll is one of the Northern Line Islands in the Pacific Ocean southwest of the Hawai`ian Islands. It consists of many heavily vegetated islets arranged in a horseshoe pattern around four lagoons and surrounded by a coral reef. The terrestrial ecosystem consists of three primary native vegetation types: Pisonia grandis forest, coastal strand forest, and grassland. Among these vegetation types, the health and extent of Pisonia grandis forest is of particular concern. Overall, the three vegetation types support 25 native plant species (two of which may be extirpated), 14 species of sea birds, six shore birds, at least one native reptile, at least seven native insects, and six native land crabs. Green and hawksbill turtles forage at Palmyra Atoll, and though rarely documented, beach nesting could be affected by terrestrial management actions. There are various nonnative or invasive species throughout the terrestrial ecosystem. The most notable examples of terrestrial invasive species include coconut palms (Cocos nucifera) and black rats (Rattus rattus). Although it is unclear whether they are nonnative, coconut palms are currently the most dominant plant across Palmyra Atoll. They compete with native plant species for space and resources and are potentially detrimental to sea birds dependent on native vegetation for roosting and nesting habitat. This competition in turn impacts nutrient resource availability, thereby reshaping energy flow in the ecosystem. Black rats are known to prey on ground-nesting sea birds and are likely responsible for the lack of burrowing sea bird reproduction at Palmyra Atoll. In addition, they may be facilitating the invasion of other nonnative species and negatively impacting other native fauna. Although the extent and impacts of these and other nonnative and (or) invasive species are not fully understood, the extent and impacts are clearly a threat to the native species and one of the most urgent threats to the overall ecosystem integrity of Palmyra Atoll. Habitat management: Maintain and enhance habitat to the extent possible to sustain thriving Pisonia grandis forest, coastal strand forest, endemic grassland, self-sustaining populations of sea birds, shore birds, coconut crabs, native lizards, and native insects. Monitoring and assessment: Acquire information on distribution and abundance as needed for conservation of each resource of concern by developing monitoring and assessment programs relevant to local, regional, and global needs. Research: Gather new information to facilitate conservation of terrestrial forest resources. This information will deal with the ecology of the terrestrial ecosystem. Planning: Achieve regional cooperation for conservation by developing a process to facilitate planning among relevant agencies and by working toward integration of resource concerns with land management plans at local to global levels. In terms of ecosystem integrity, prevention is the most effective and efficient tool for managing invasive species. There are various potential pathways for introduction and spread of nonnative species within Palmyra Atoll’s terrestrial ecosystems, and these concerns have largely been addressed within the “Biosecurity Plan for Palmyra Atoll”. Several invasive species have already become established at Palmyra Atoll, however, and control of coconut palms and rat eradication are the major priorities for adaptive forest management action. Other critical steps to minimize the impacts and spread of invasive species include early detection through inventory and monitoring, as well as containment, control, and management of other nonnative species already established at Palmyra Atoll. These efforts in combination with research and education will serve to inform management decisions related to ecosystem integrity. Along with reinstating ecosystem integrity, this “Terrestrial Forest Management Plan for Palmyra Atoll” aims to evaluate other risk factors that possibly may compromise the persistence of natural resources at Palmyra Atoll. To that end, an adaptive management process of monitoring and plan audit and review is highly recommended to ensure the implementation and efficacy of the management practices outlined above. In addition, it will be important to identify other stressors and threats to the terrestrial ecosystem to prioritize additional management actions. It is essential to develop partnerships with relevant agencies and participate in collaborative efforts to evaluate the best management practices for protecting and conserving these resources into the future, as well as to forecast and avoid potential problems over the long term. We advise ongoing assessment of this “Terrestrial Forest Management Plan for Palmyra Atoll”, as it contains strategies that require widespread cooperation and coordination to be effective. The “Terrestrial Forest Management Plan for Palmyra Atoll” is a working document and subject to periodic review, refinement, and improvement as new information becomes available. The strategies associated with incipient and established nonnative species will continue to be developed and should be implemented in an adaptive management framework. Constant review and evaluation of these management procedures will provide important management information to improve protocols and methods. Refining conservation goals via feedback loops can improve the ability of TNC and their partners to make effective decisions in evaluating and conserving ecosystem integrity. Hathaway, S.A., McEachern, K., and Fisher, R.N., 2011, Terrestrial forest management plan for Palmyra Atoll: U.S. Geological Survey Open-File Report 2011–1007, 78 p.